Hello, Everyone! Our brief blogging hiatus is over and we’re back in blogging action! For the past few weeks, while we haven’t been busy writing our blog, we have been busy renovating and relocating to a new office. We are very excited to be in a new office space and are looking forward to sharing it with our clients! We’ll post some pictures of the new space to our blog soon. 1) Friendship is one of life’s greatest gifts; friends who are willing to carry large boxes up and down awkward staircases for you, and who are willing to stay awake into the wee hours of the night helping you assemble Ikea furniture, are THE greatest! 2) Like any period of transition, moving (as overwhelming and maddening as it can be at times) provides us with a prime opportunity for reflection and reassessment of our lives. 1) What is happening in my life right now and how do I feel about it? What is the reality I’m currently facing? 2) How have my past experiences helped me get to where I am now (good, bad, or otherwise)? What have I already experienced that can help me get through any current challenges? 3) Where do I want to go from here? What path do I want to be on? What is the vision I have for myself going forward? What am I willing to do to get there? What resources are available to help me move forward in this direction? Change can be difficult. However, taking time to ask ourselves these types of questions during periods of transition can help us to create lives that are more purposeful and, when we live with purpose, we tend to feel our best! Categories: Goal Setting, Uncategorized | Permalink. Welcome, 2014: Setting Your New Year’s Resolutions! Lately it seems that New Year’s Resolutions have gotten a bad rap. How many of you have had this experience: you tell a friend or family member about your resolutions for the new year, and they respond with a chuckle, saying something along the lines of, “tell that to me again in two weeks if you’ve managed to stick it out that long!”? Keeping your New Year’s Resolutions isn’t necessarily easy. Not long after the ball drops in Times Square, many people find that they’ve already “dropped the ball” on their goals for the year ahead! We imagine that this has to do with a number of things, including setting unrealistic goals, lack of access to important resources, setting goals that you’re not truly invested in to begin with, etc. But, in spite of all this, some research shows that setting goals at the beginning of the year, as opposed to any other time of year, can actually increase the likelihood of achieving those goals, particularly if you approach your resolutions thoughtfully. The beginning of the year is a natural time for purposeful reflection. The intersection between the end of one year and the beginning of another is a perfect opportunity to examine where you’ve been (e.g., your accomplishments and hardships from the previous year) as well as where you’re heading (e.g., who do you want to become and what do you hope to experience in the year ahead)? As 2013 comes to an end, we encourage you to take pause and consider what is truly most important to you at this time in your life. Ask yourself the following questions: how did I live out my values in the past year, and how can I more intentionally live out my values in 2014? You can also check out our previous blog post on goal setting, including how to set S.M.A.R.T. goals and the importance of planning for failure when striving for success, for more tips on how to create New Year’s Resolutions that stick. Here’s to your New Year’s Resolutions! Wishing you peace, love, and wellness in 2014! Categories: Goal Setting, Motivation, Uncategorized | Permalink. When it comes to time management challenges, procrastination takes the cake…and it’s not a tasty cake, at that! In fact, procrastination has been linked to such unpleasant things as poorly managed stress, health issues, and sleep complications. If you struggle with procrastination, you’re most likely familiar with its costs and you know that it’s a habit worth rectifying…today, not tomorrow! It’s important to note that procrastination is a specific type of “putting things off”. In essence, procrastination occurs when we delay important tasks without good reason, or as a result of anxiety. What do we mean by, “without good reason”? Basically, this means that the delay in completing a task occurs for reasons other than those which would actually help to increase productivity. In other words, it’s a needless delay. By contrast, when we choose to delay a task because we know that, if we wait it out a bit, we’ll have more of the tools and/or resources available to us to do the job well, that’s not the same as procrastination – that’s just good planning! The same goes for when we delay an important task because there is another more important task which needs to be completed first – that’s called good prioritizing! It’s important to distinguish procrastination from the acts of planning and prioritizing, which are healthy time management skills. You can do this by paying close attention to your repeated behaviours around a task, as well as tapping into your feelings about a task. What types of activities/tasks you tend to procrastinate: Do you notice any themes? Are there certain types of tasks you tend to put off more than others? How you tend to procrastinate: What are your procrastination behaviours, or stalling techniques? For example, do you watch t.v. instead of working on an important task? Suddenly get the urge to re-organize all of your drawers? Make a snack…and then a cup of tea…and then wash up the dishes? Why you procrastinate: Procrastination can occur for several reasons, such as feeling overwhelmed and/or anxious about a task and unsure of where to begin; feeling creatively stunted (e.g., writer’s block); succumbing to distractions; simply dreading the task at hand; and lacking confidence in your abilities, which often goes hand-in-hand with holding unrealistic expectations for oneself. What are your specific reasons for procrastinating? What feelings do you notice coming up in regards to a particular task? Whether or not the behaviour you’ve listed is truly procrastination, or if it’s more an example of putting things off in order to ultimately increase your productivity. Tip: if you notice yourself saying/thinking things like, “I do my best work under pressure” or “I have plenty of time to get that done!”…chances are, you’re about to engage in procrastination behaviour. If you lack confidence in your abilities, find opportunities to grow your skill set – take a course, or do some research. It might be necessary to re-assess the standards you’ve set for yourself, as well. Perfectionism and procrastination are close companions, but perfectionistic standards are the enemy of productivity. 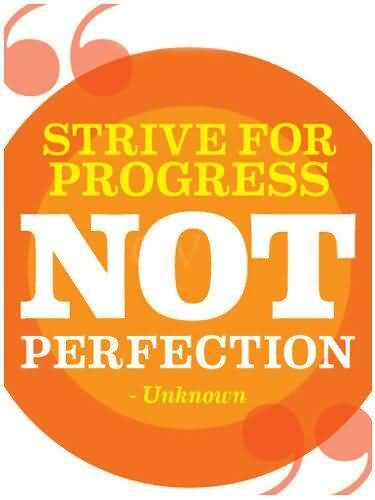 Remind yourself: it’s not about achieving perfection, it’s about making progress. Progress is your goal. It’s important that the environment you’re working in is conducive to productivity, particularly if distractions are an issue for you. Remove visual distractions, such as clutter; turn off your phone; shut the door; etc. One of the greatest distractions for people these days is the internet and, in particular, social media sites. If this is an issue for you, try using a program such as http://getcoldturkey.com/, which will block your access to social media sites, games, etc. for set periods of time. If you’re feeling overwhelmed by a task/project and unsure of where to begin, start by breaking it down into much smaller chunks. Asking a friend or colleague to help you with this type of planning can sometimes be helpful, particularly if you struggle with planning tasks more generally. Chip away at the larger project, one small chunk at a time! Make sure to take breaks as you work through a task. It’s often recommended that you follow every 50 minutes of work with a 10 minute break. Taking short, scheduled breaks can help to increase your focus during work times and mitigate feelings of overwhelm, lack of concentration, and burnout. If you’re feeling creatively blocked, try changing up the scenery – go out for a walk, try working from a different room/location, or have a quick brainstorm session with a friend to “get out of your head” and try to generate some new ideas! If you just hate, hate, hate the task at hand, try rewarding yourself upon completion. The size of the reward should be comparable to your degree of productivity – if you completed several parts of the task, then you get a big reward! If you accomplished a little bit, you get a small reward! Another strategy is to try committing to the task for a short period of time, such as 10 minutes. The idea here is that you commit to focusing on the task for 10 minutes and, if at the end of 10 minutes you’re still loathing it, let yourself walk away for the time being. Oftentimes, once we get started on the dreaded task, we’re able to keep going for longer than we expected! It’s similar to the notion that, the most challenging part of exercising is getting into your workout gear/getting out the door/getting to the gym – once you’re dressed and where you need to be, it’s usually not as bad as you were anticipating! Categories: Goal Setting, Motivation, Procrastination, Uncategorized | Permalink. Goal Setting: Planning for Failure is Key to Achieving Success! Setting clear and achievable goals can help to maintain a healthy level of self-esteem. When you’re working towards something that is important to you, and when you do so in a purposeful way, you are likely to feel more positively towards yourself. Setting clear goals at the outset of any new venture – whether it be related to work, relationships, fitness, personal development, etc. – is really important; without clear goals from the very beginning, it can be easy to lose sight of what you hope to achieve, and it becomes more difficult to measure your progress along the way. It’s for these reasons that we like to spend time discussing counselling goals with our clients in our very first meeting. Measurable: How will you determine progress? How will you know when your goal is met? Attainable/Action-oriented: How will you achieve your goal? What resources will you use? What steps will you need to take? Realistic/Relevant: Is the goal realistic, in the sense that it is something you have control to change? Why is the goal important to you in your life at this time? How is it connected to your values for living? Time-bound: By when do you plan to achieve this goal? What is your timeline? Each aspect of S.M.A.R.T. goal setting is important and builds upon the others to strengthen and clarify your goals. That being said, when setting goals, we’d encourage you to pay particular attention to the “R”; that is, making sure your goals are realistic and relevant. The reason that we highlight the “R” elements is because, so often, people will set goals for themselves that are quite simply unrealistic and unachievable because they leave no room for slip-ups! Then, as soon as they miss a day at the gym, or as soon as a disagreement happens with their spouse, it’s all out the window. “All or nothing” goal setting simply won’t work. In order to experience success in your goals, you must leave yourself some room for failure. We suggest adopting an “80:20” attitude when it comes to realistic goal setting – that is, 80% of the time you will be acting in accordance with your goal, and 20% of the time you leave room for human error! Setting realistic goals means that you’re expecting to have both good and bad days right from the outset, so when the time comes that you fall off track (and you likely will, as we all do! ), you’ll be better able to view the situation as a momentary lapse, rather than taking a totalizing perspective. The other “R” factor, relevance, is also of particular importance. If your goals aren’t relevant or meaningful to you, then you’re less likely to achieve them. Ask yourself: what are my reasons for wanting this goal now? What are my reasons for not wanting this goal now? If it turns out that your reasons for not wanting the goal outweigh your reasons for wanting it at this time, then it may be beneficial to re-assess the goal in the first place.